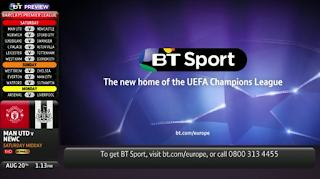 BT has confirmed its second free-to-air Champions League fixture to be shown on its Freeview channel BT Sport Showcase. The telecoms giant has selected the Roma v Barcelona match on Wednesday 16th September 2015 as its freebie for week 1 of the tournament. Coverage starts at 7:15pm (kick-off 7:45). The match will also be shown on BT Sport Extra 1, which is available in HD for BT TV subscribers. All other week 1 fixtures, including all games involving English sides will only be available via BT's subscription channels. On Thursday 17th September, BT will show Anderlecht v Monaco live from the Europa League on Freeview channel 59. Coverage begins at 7:30pm. BT will show a minimum of 12 Champions League and 14 Europa League matches per season in addition to other sporting events via its Freeview channel. The BT Sport Showcase channel is exclusive to Freeview and YouView. On Virgin Media, free sports events from BT Sport are shown on part-time channel 548. So far, no live sport has been made available on Sky. The above article was updated on 16/09/2015 to reflect the change to the originally billed 7:30pm start time for Roma v Barcelona. Irish football fans hoping to catch last round's Club Brugge v Man U fixture on free-to-air satellite platform Saorsat found that coverage on RTÉ2 had been blacked out. It's the first time a Champions League match has been denied to viewers in the Republic of Ireland reliant on the service. Usually, only RTÉ viewers in Northern Ireland who can't receive RTÉ direct from the Republic have events blacked out due to rights reasons. Saorsat is broadcast from a different satellite to Sky and Freesat, requiring a different satellite set-up. Its footprint is heavily restricted to Ireland, which usually enables RTÉ to broadcast freely without broadcast rights implications. 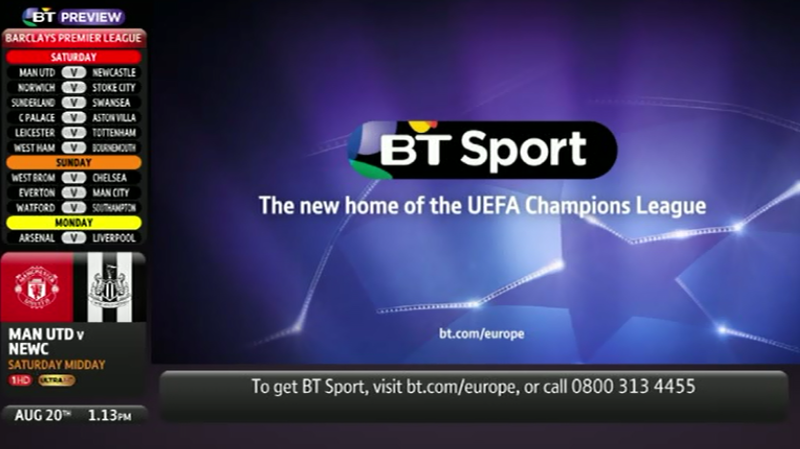 However, it overspills across Northern Ireland, where BT Sport has the exclusive rights to the Champions League. Saorsat is used mainly in remote parts of the Republic of Ireland where the terrestrial Saorview service is not available, and provides RTÉ and TG4 for free, so that viewers don't need to subscribe to Sky to get a basic TV service. As one of the affected saorsat viewers I would like to see methods of watching BT for free advertised on line (obviously I would prefer the legal route of watching. However BT are depriving me of this). Any suggestions?